At the last Denver Mancuso Quilt Festival, I purchased some quilting tools that looked extremely promising. The first was a tool for trimming perfect half-square triangle blocks from Bloc Loc. The second was a set of tools from guidelines4quilting that promised to make cutting strips easy and ruler-slippage a thing of the past! When using this product, be sure not to push the edge of your fabric too hard against the fabric guide. 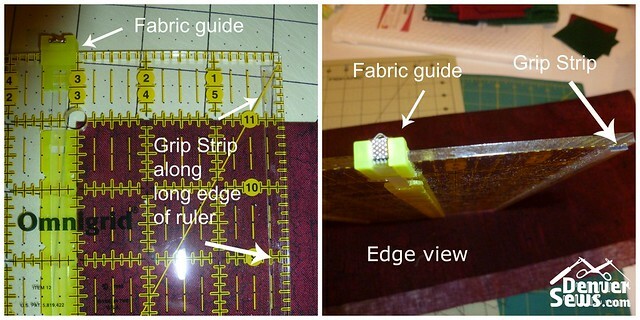 The guide is held onto the ruler with clips on the ends and some clear elastic. If you push the fabric too hard, the guide will move just a little because of the elastic. The sewn squares came out pretty darn close to the target square size, but were not perfect. So I tried one more time using the same tool plus the Bloc Loc I had purchased. 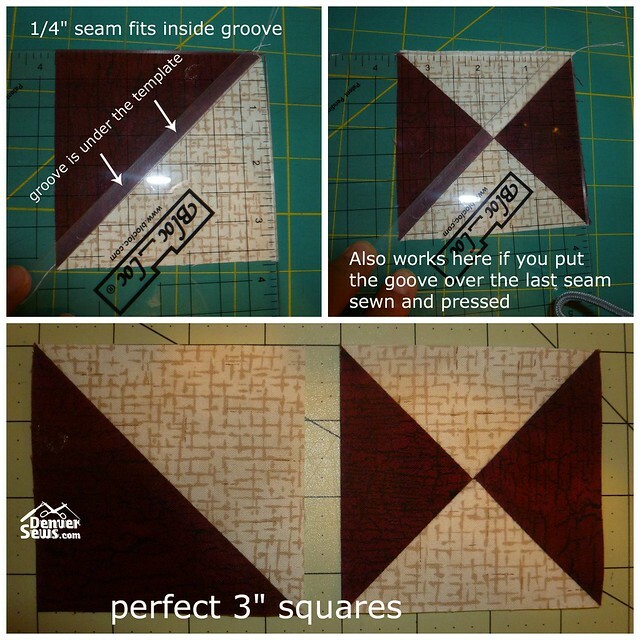 I set the fabric guide to 3.25″ squares with the idea of making 3″ squares. I cut squares for half-square and quarter-square triangles and sewed them together. Using the Bloc Loc I could square them off very precisely. Bloc Loc makes the square ruler in different sizes, but you can certainly use a larger one with smaller squares. They also make a similar product for flying geese blocks. I am really pleased with my latest acquisitions. The guidelines4quilting Grip Strips really work nicely to keep my acrylic rulers from slipping. 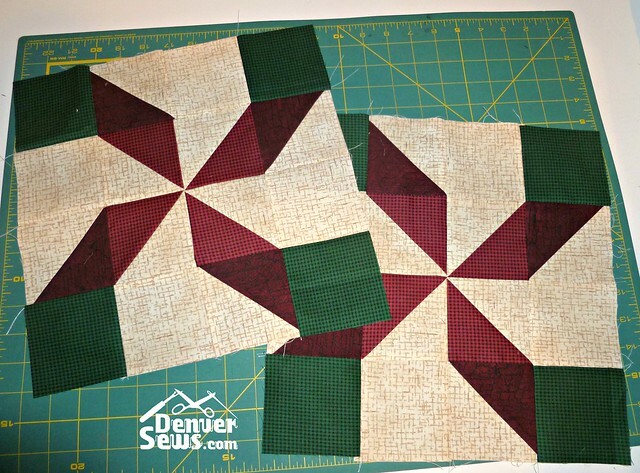 It’s a blast to be able to cut squares, half-square triangles and quarter-square triangles with my Guidelines Ruler and the Seam Allowance additions. 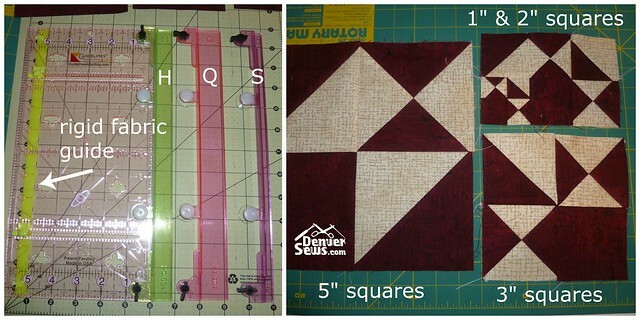 For perfect squares, set the fabric guide to about 1/4″ larger than your target size. Then use the Bloc Loc ruler to square up the sewn blocks. These are all great tools that I hope to use on a future quilting project. Disclaimer: I was not given these tools nor was I asked to review them. I simply thought they looked useful and decided to give them a try. Oh I love the idea of the Loc Bloc. I will have to check it out. 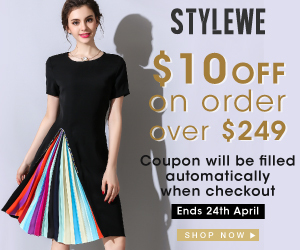 Lynne I love your reviews, I always find such great tools and information when I visit your site. Thanks.